Data centers face growing pressures to store more with flat-to-shrinking budgets. Keeping systems operational for as long as possible to maximize investments can be an effective part of the strategy, but supporting those legacy applications becomes even more challenging as drive technologies move to next generation formats and interfaces. Ultrastar 7K2 has a SATA 6Gb/s interface and native 512-byte (512n) sector size to provide consistent, high performance and compatibility with legacy data center applications. Enhanced RAFF™ technology in the 7K2 includes sophisticated electronics to monitor the drive and correct both linear and rotational vibration disturbances in real time-especially helpful in multi-drive arrays and rack-mounted systems maintaining high read/write performance. 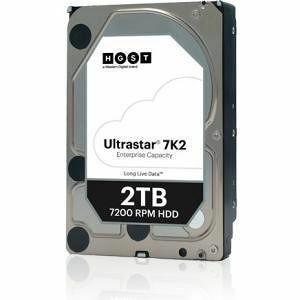 Designed to handle workloads up to 550TB per year, the Ultrastar 7K2 delivers up to 2TB of affordable storage capacity for high-intensity applications in enterprise-class environments.